Happy Independence Day to all the lovely Spinsters out there! Today's post isn't really directly patriotic. But, in the spirit of the holiday, I thought we might have a star-themed post. This post is definitely heavy on the earrings, but I can't help it. I love earrings. So let's look what we've got here. These are on clearance and more than half off. For the lady who likes a little more dangle than the one who'd wear #7. This is special anniversary edition packaging, and I love it. The glitter moves inside the clear layers, I think. I love it. This is a more affordable version of a set of Loeffler Randall sandals that cam out several years ago. I loved them then, and I love them now. I really like the look of c-hoop earrings. That's pretty much it. 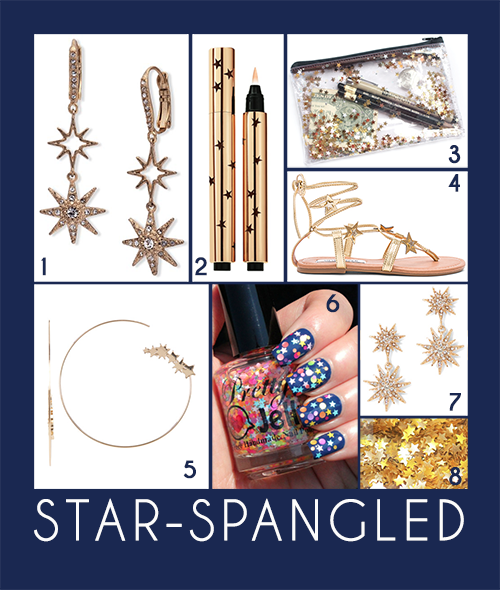 While these colors aren't really "American," You're much more likely to wear this polish year-round, justifying the $8 price tag. 7. Sparkling Star Drop Earrings: $9.97, New York & Co. These are on sale for 50% off, and I think they're a steal at just under $10. I mean, who couldn't use a dose of star-shaped edible glitter? All right! That's all for now! Happy Fourth of July!